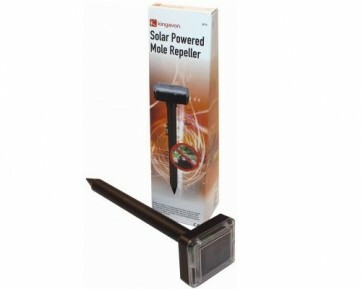 This solar powered mole repeller will work in all weather by emitting sonic waves that moles do not like with a frequency of 20 seconds. It can operate for 24 hours continuously on a full charge & is harmless to all other animals & humans. It includes 2 rechargeable 1.2V AA type Ni-MH 600mAH batteries. Charging Time: 6-8 hours (in sun).